My dear friend Sijia is turning 25 today! To celebrate this momentous occasion, I wanted to make her a very special cake. Sijia is a very classy, elegant person, and I wanted her cake to reflect that. 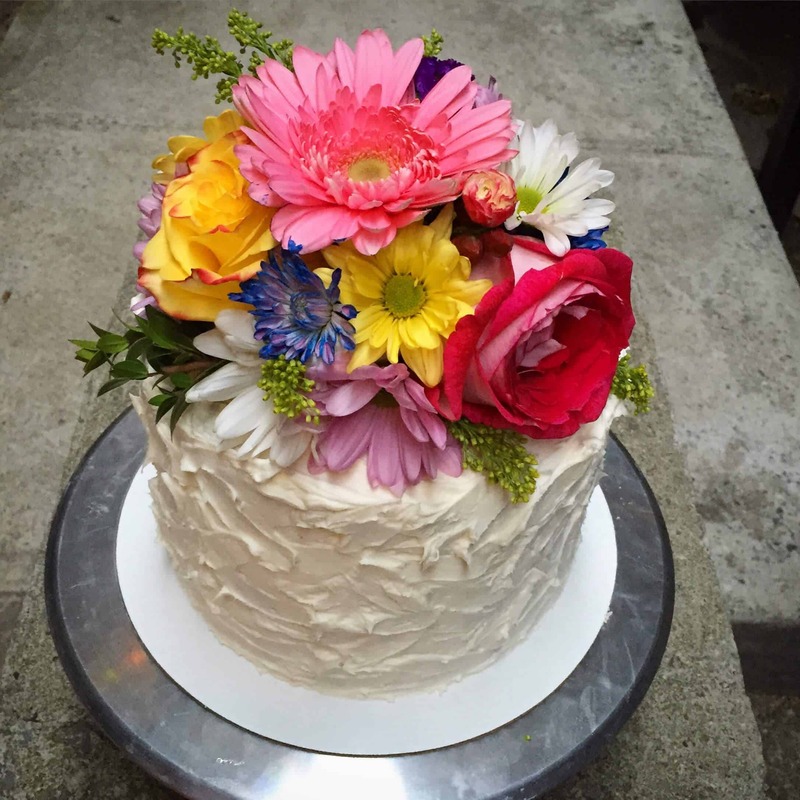 I ended up making my very first real floral cake. It required a beautiful bouquet, some floral tape, and a lot of thin wire. 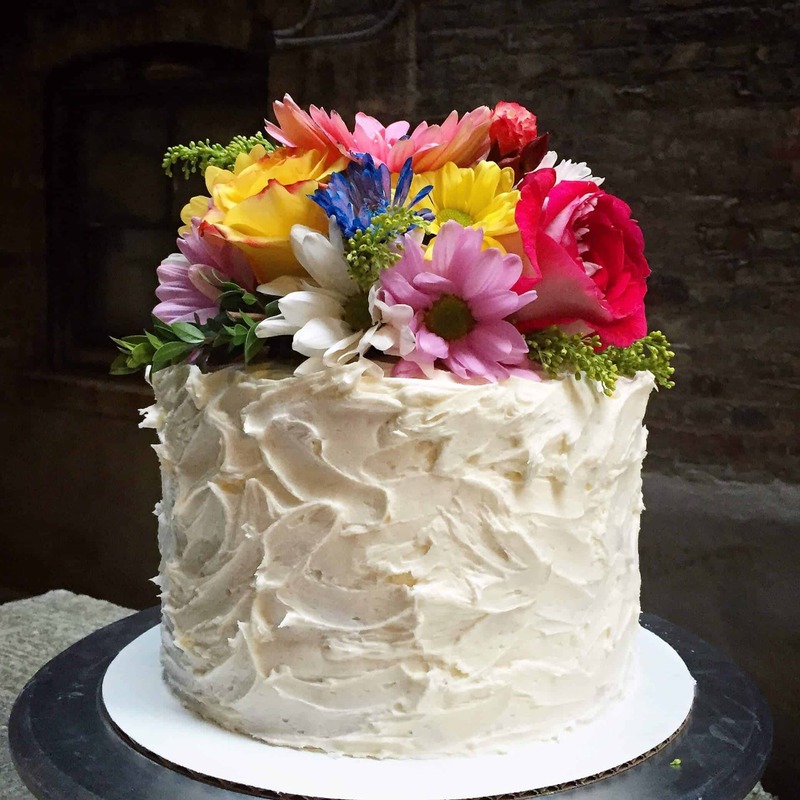 I made a classic, three-layer white cake, with my favorite vanilla buttercream. Preheat oven to 350º Fahrenheit. Prepare and line three 7-inch round cake pans, then coat with nonstick baking spray. Cream together butter and shortening until light and fluffy with a hand mixer or Kitchen Aid. Slowly add the sugar, one cup at a time. Make sure to fully incorporate each cup before adding another. Add eggs one at a time, also making sure to fully incorporate each egg before adding another. Sift together flour, baking powder, and salt. Add 1/3 of the dry ingredients into the butter and shortening mixture, followed by 1/2 cup of buttermilk. Repeat, mixing in another 1/3 of the dry mixture, followed by the remaining half cup of the buttermilk. Mix in the remaining third of dry ingredients, and gently stir until fully incorporated. Scrape down the sides of the bowl with a spatula to ensure the batter is fully mixed. Evenly distribute cake batter between cake pans, and place pans into oven. Bake for 25-30 minutes, or until a toothpick or cake tester inserted in the center comes out clean. Remove and allow to cool slightly in cake pans for about 5 minutes, then cool completely on a wire rack. While the cake cools, prepare the buttercream. Beat the butter on high for two minutes, until light and fluffy. Slowly add in the powdered sugar, 1 cup at a time. Alternate with splashes of cream. Once fully mixed, add in the vanilla and salt, and beat on high until the frosting is fluffy, and has reached the desired consistency. If the frosting is too thick, add in cream (1 Tablespoon at a time). If the frosting is too thin, add in more powdered sugar (half a cup at a time). Once the cake has fully cooled, frost and stack the cake layers, applying a thin crumb coat to the exterior of the cake. Refrigerate for a half hour, to let the frosting harden. Frost the exterior of the cake with the remaining frosting, and use a spoon to make swirls for a textured exterior. Place in the freezer for 15 minutes to allow this layer of frosting to set.